Seldom Creek Falls in the Southern Oregon Cascades - Explore! Seldom Creek Falls in the Southern Oregon Cascades - Explore! At almost 5,000 feet in elevation, Great Meadow, near Lake of the Woods, Oregon, normally collects a lot of snow through the winter. Centuries ago Great Meadow was underwater year-around as part of what is now Lake of the Woods. It was discovered by European adventurers in the mid-1800’s although it was well known to the natives of the area centuries before that. In 1888, Judge John Waldo saw Lake of the Woods from the peak of Mount McLaughlin and noted that it had: “a yellow strip of prairie of several hundred acres at its north end.” Even into the 1920’s, Lake of the Woods regularly flooded great meadow. Then, drainage ditches were constructed to offer an opportunity to construct recreation facilities for summer visitors to Lake of the Woods. While the planned golf course and baseball fields were never constructed, the meadow was used as an airstrip from the lake 1930’s to the 1960’s. You can still see evidence of the strip through the middle of the meadow in the above photo. 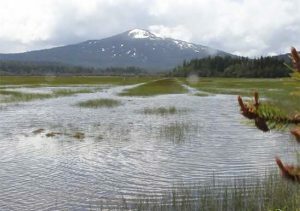 Now days, spring rains and warmer temperatures melt the snow in Great Meadow and, with the addition of snow melt from the surrounding mountains, a seasonal wetland appears. The runoff is slowed by Grand Yogi Dam constructed by the U.S. Forest Service in 1990, and named for its designer, to retain the wetland as long as possible for the benefit of nesting waterfowl and the animals of the area. As the water rises, it passes through the dam into Seldom Creek, aptly named because it has water in it only in the spring. The slow moving water wanders through the Winema portion of the Fremont-Winema National Forest parallel to Highway 140 headed east. 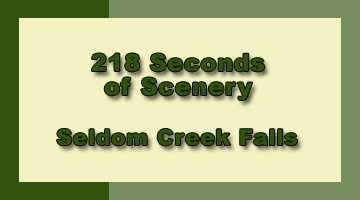 As it moves eastward it passes under Dead Indian Memorial Highway and then turns northward and suddenly falls into a steep, rocky canyon, creating Seldom Creek Falls. 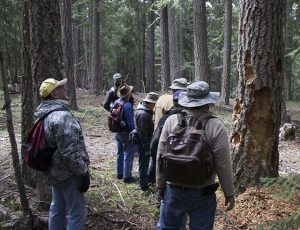 On a Saturday in May, I joined nine other members of the Klamath Basin Outdoor Group to explore the creek and the waterfall. While one could park at the rest area adjacent to Great Meadow, we parked our vehicles just off the Dead Indian Memorial Highway on a Forest Service Road. 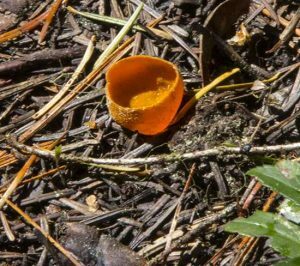 The leader of this expedition promised a short, easy hike through open fir forest. 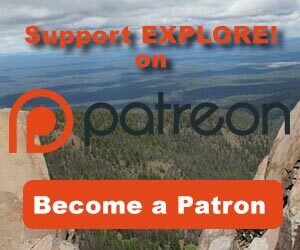 We walked northeast along Highway 140 to a point near the end of the guardrail that extends from Dead Indian Memorial Highway, then headed out through the forest. 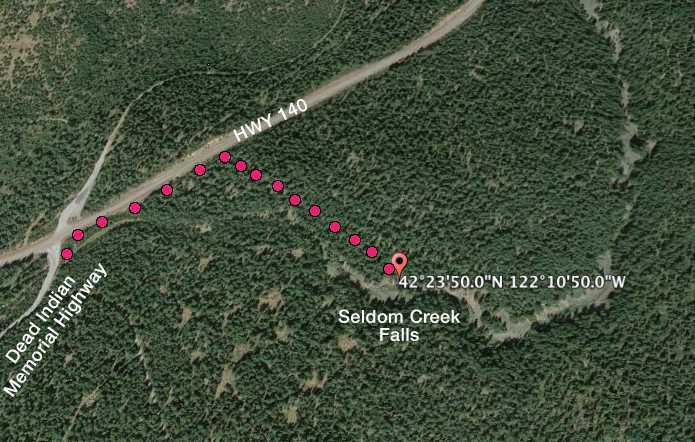 The waterfall of our search is on a southeast heading from the highway, but we headed a bit to far eastward and explored some of the country between the highway and Seldom Creek. Along the way we spotted a tree damaged by wildlife (above). 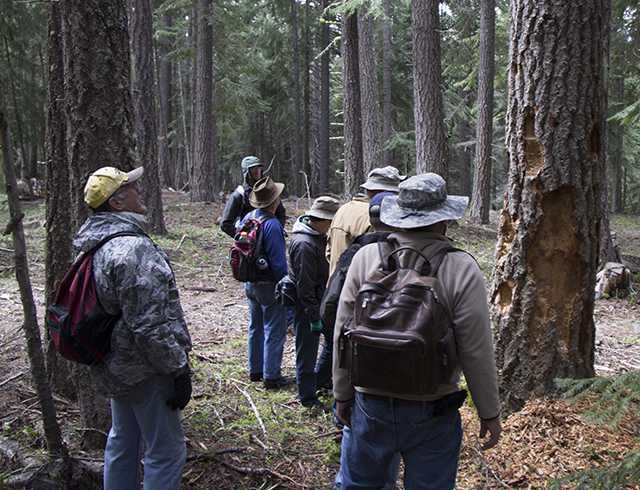 The consensus was that the damage was caused by an overachieving woodpecker, but it could have been a bear. 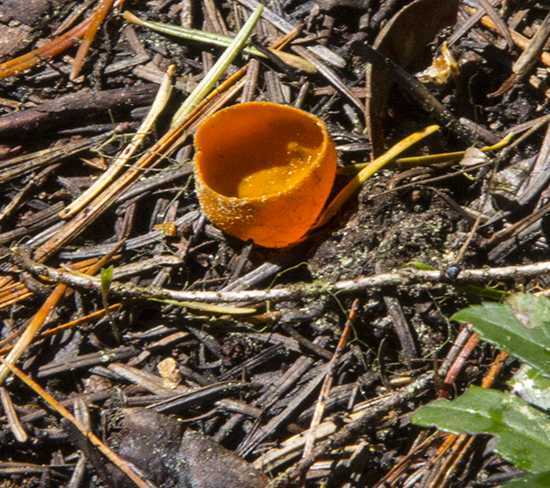 There were also a lot of orange cup fungi scattered around the forest floor (below) to add some unusual color. After reaching the creek and scrambling down the steep canyon slopes, we concluded that we were downstream of the falls. We climbed back up the slope and followed the canyon upstream. We were in the forest and that offered much easier walking than the loose rock slopes of the canyon. The roaring water guided us easily to the falls. There are great views of the falls from the top of the canyon as well as from the bottom of the canyon. As before, the walk down into the canyon is more challenging than the walk through the forest. Nonetheless, it’s a short walk and we navigated our way through the loose rocks without any mis-adventures. 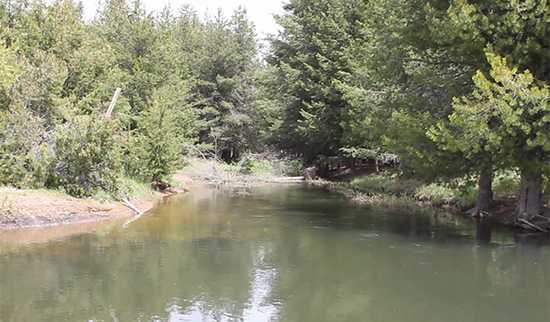 The video offers a look at Great Meadow and the headwaters of Seldom Creek. Next we examine the creek well below the waterfall and finally we spend some relaxing time watching the falls from various viewpoints. 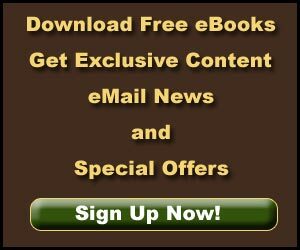 You can find a higher quality version of the video on YouTube. 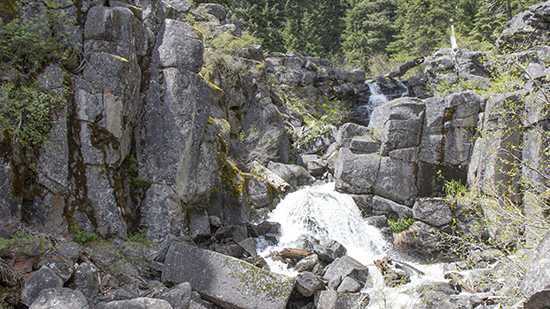 The waterfall in Seldom Creek is unknown even to most of the local residents of the southern Oregon Cascade Mountains. If you visit it, be sure to go in the spring while Great Meadow is filled with water or you will find only a jumbled pile of rocks.